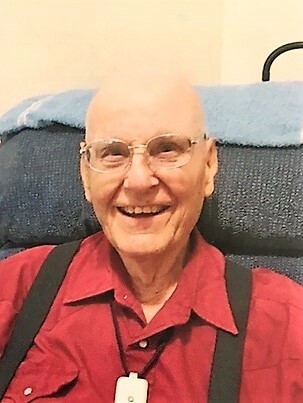 Alfred “Dale” Hazen died December 2, 2018 at the age of 90 at the Andbe Home in Norton, KS. Dale was born on April 1, 1928 on a farm south of North Platte, NE, to Neil and Frances (Meyer) Hazen. He attended school and then worked on the family farm throughout his childhood before entering the Army at 18 and serving in Korea. Dale married Donna Gilliland on May 3, 1953. They were married for 56 years. They were blessed with four children; Allen, Dennis, Joyce and Arlas. The family farmed in the Maywood area, and owned the café in Maywood for several years along with the Yellow Diamond bus lines. In later years, Dale and Donna managed motels in Colorado and Wyoming. Dale was a professional truck driver for many years loved to talk about the experience, often taking his kids with him and handing the love of trucking on to his sons. Dale and Donna enjoyed traveling the country in their RV visiting family, camping, fishing, and researching family genealogy. Dale loved his grandkids and great grandkids and talked about them often. The fondest memories that his grandchildren have are of fishing and camping at the Wellfleet and Norton Lakes, traveling around in the RV, building toys in the garage, and listening to stories. He loved to joke and tease and was a loving husband, father and grandfather. He will be greatly missed by his family and friends. Dale is survived by his children Allen Hazen of Curtis, Ne; Dennis (Deb) Hazen of Curtis, Ne; and Joyce (Duane) Fischer of Norton, Ks. He is survived by 20 grandchildren; Jeremy Hazen of Oskaloosa, Ia; Ambjour (Brandon) Parsons of Oskaloosa, IA; Chad Hazen of Lincoln, Ne; Shawn (April Otto) Hazen of Lincoln, Ne; Bryan (Jennifer) Wood of McCook, Ne; Kacey Wood of Madrid, Ne; Dakota Hazen of Curtis, Ne; LeahAnn Hazen (Aldarion Huffman) of Wichita, KS, Jonathon Hazen of Curtis, NE; Michael Hazen of Curtis, Ne; Jasmine Tutlam-Hazen of Curtis, Ne; RJ Tutlam-Hazen of Curtis, Ne; Rikki (RD) Wait of Norton, Ks; Crystal Fischer of Norton, Ks; Shine (Erinn) Fischer of Pembroke Pines, Fl; Aislinn (Randy) Nelson of Curtis, Ne; Rachel (Tyler) Faber of Curtis, Ne; Craig (Brittney Kramer) Hazen of Curtis, Ne; Cassandra (Dustin) Wright of North Platte, Ne; Sarah Smith, North Platte, Ne and many great grandchildren. Dale is survived by his brother Gene and wife Marlene Hazen of Globe, Az; sister-in-law Delores Hazen (wife of Keith), Globe, Az and many other nieces, nephews, cousins, family and friends. Dale was preceded in death by his parents Neil and Frances Hazen, son ArIas Shawn Hazen, grandson Kirk Daniel Smith, sister Maxine and husband Raymond Shirlaw, his brother Lyle and wife Liz Hazen, and his brother Keith Hazen. Memorial services will be held Sunday, December 16th at 2:00 p.m. at the Maywood Christian Church in Maywood, NE with Pastor Dale Heimer, officiating. Burial of cremains will follow at the Curtis Cemetery. In Lieu of flowers memorials may be given to the Maywood Christian Church.